A beautiful image of the Zen Garden that captures its peaceful atmosphere. 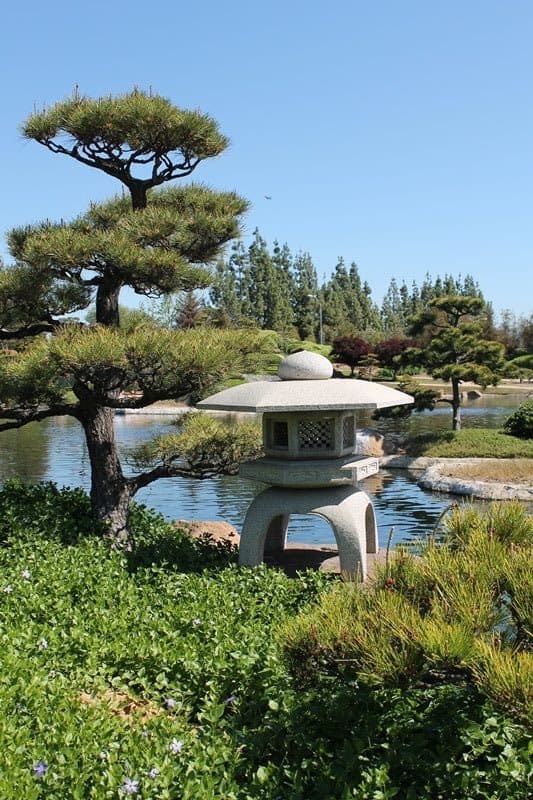 In a valley surrounded by the vast city of Los Angeles, there is a tranquil escape from the modern world that takes you back to ancient Japan. 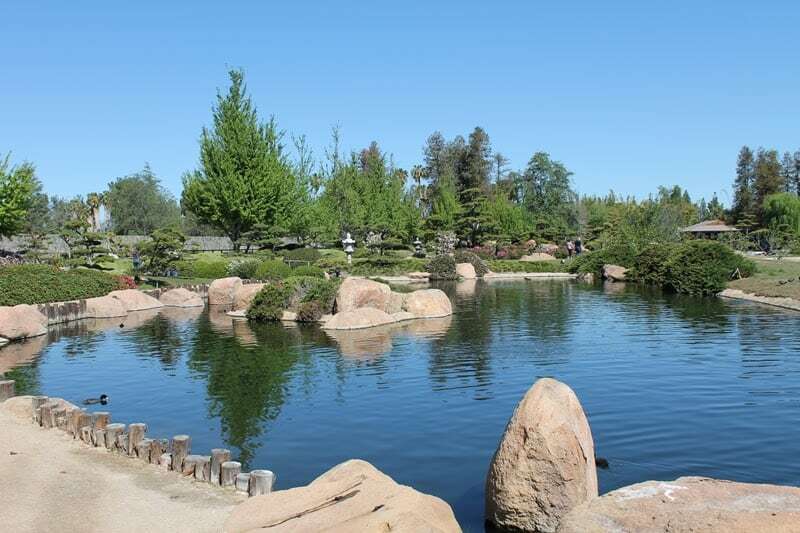 This little jewel, just a half hour north of downtown on the 405, (in a perfect world with no traffic) the Suiho En, “Garden of Water and Fragrance” is an island of quiet and reflection in the heart of the 2,0000 acres Sepulveda Basin Wildlife Area. Even more fascinating is the fact that it borders a major water reclamation plant, and that these two entities, as different as night is from the day, complement each other not just aesthetically, but practically as well. 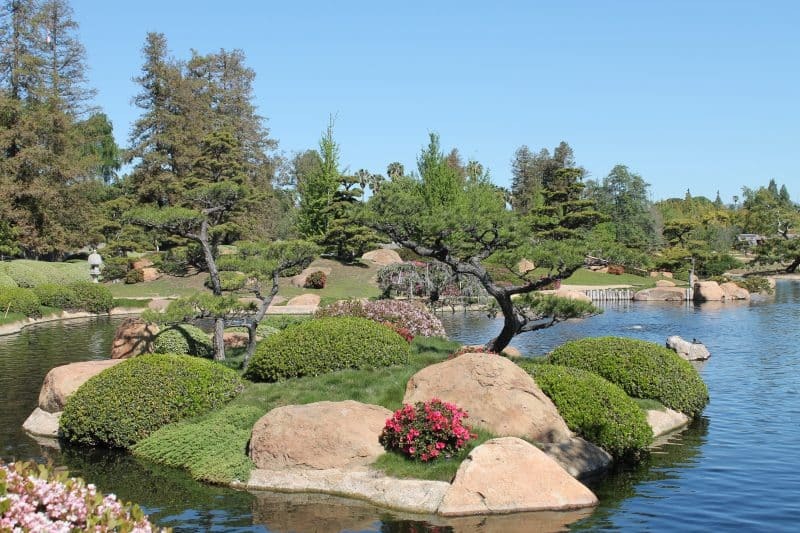 The garden was designed by Dr. Koichi Kawana, the same gentleman who created the garden at the L.A. County Museum of Art, among a dozen others throughout the United States. It is in a style known as Chisen-Kaiyushiki, meaning (wet garden with promenade) and it was patterned to resemble traditional walking gardens on the large rural estates of feudal Japanese lords. 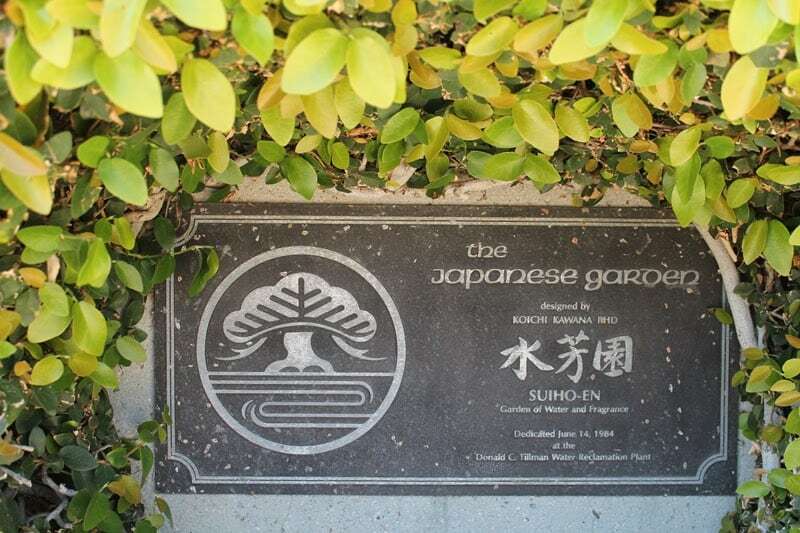 It encompasses three different traditional types of Zen gardens in one. 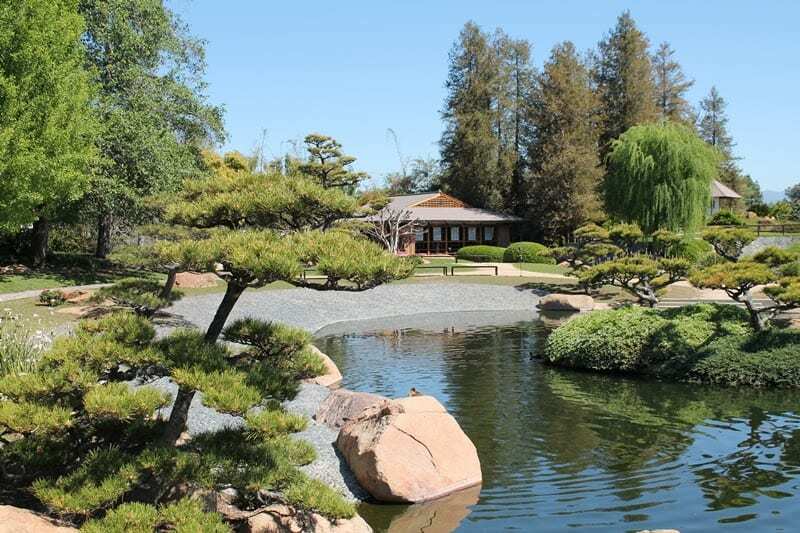 Visitors can wander among 6 ½ acres of stone lanterns, (each hand carved by an artisan in Japan) curved bridges, beautiful Bonsai landscaping, a traditional tatami tea house, plus lakes and waterfalls filled with waterfowl. It is a trip to ancient Japan all in the course of a day. All of the water used to create this mini paradise is recycled and pumped directly into the garden from its immediate neighbor, the Tillman reclamation plant, which also supplies clean water to over 800,000 local residents. It is a perfect merging of old world beauty with modern technology. The garden is a living postcard with six varieties of trees and four different types of large stone lanterns. 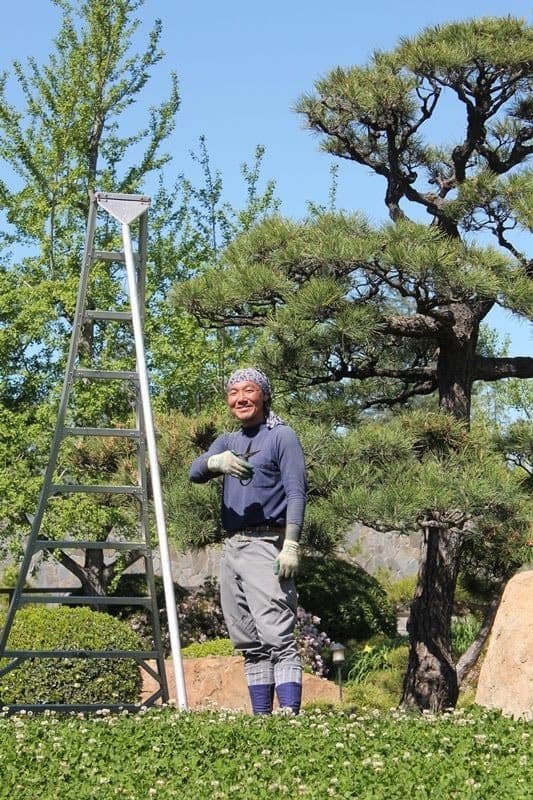 It is tended by a fleet of gardeners trained in traditional Bonsai methods and their work reveals them to be not just masters of their craft, but true artisans of the highest order. Each plant and flower receive personal attention and the trees and bushes are sculpted like renaissance statues. Since it is in the middle of a wildlife refuge, the spacious ponds and water flow play host to numerous birds including Blue Herons, Snowy Egrets, Cormorants, and Coots, while the tall and stately Canadian Geese seem to be the local alpha bird. The most colorful denizens are the Egyptian Geese with their golden eyes that seem to come with their own heavy dose of mascara. Their small cousins, dragonflies, seem ubiquitous there, landing often on visitors for a curious look before wending away like tiny drones. Large colorful Koi swim languidly just below the waters’ surface coming to shore whenever they see a persons’ shadow in hopes of getting a free meal and hiding beneath colorful yellow and fuchsia water lilies when they have eaten their fill. Wherever you look, there is a photo waiting to be taken. There is such a feeling of spiritual contentment and peacefulness that you automatically speak in whispers for fear of disturbing the Wa, (Balance of nature). No one is in a hurry and no one will bother you if you simply wish to sit and think the entire day. While sitting in this cornucopia of nature, it is hard to believe you are surrounded by a city of eight million people. In the Tatami House, traditional tea ceremonies are performed, among the various other events and festivals the garden hosts throughout the year. There is a gift store filled with books about the garden, fascinating Japanese arts and craft, especially origami, (Folded paper animals) and a friendly staff that is eager to supply a visitor with information and history. Stone lantern and lake in the garden. If the place looks familiar, even to the first time visitor, it just may be that you saw the garden and the Tillman plant in several movies, especially the ever popular Star Trek franchise. The gleaming steel and glass, futuristic looking edifice, has doubled as Starfleet Academy in Star Trek Next Generation, Star Trek Voyager, and Star Trek Deep Space Nine, just to mention a few of its cameo roles. 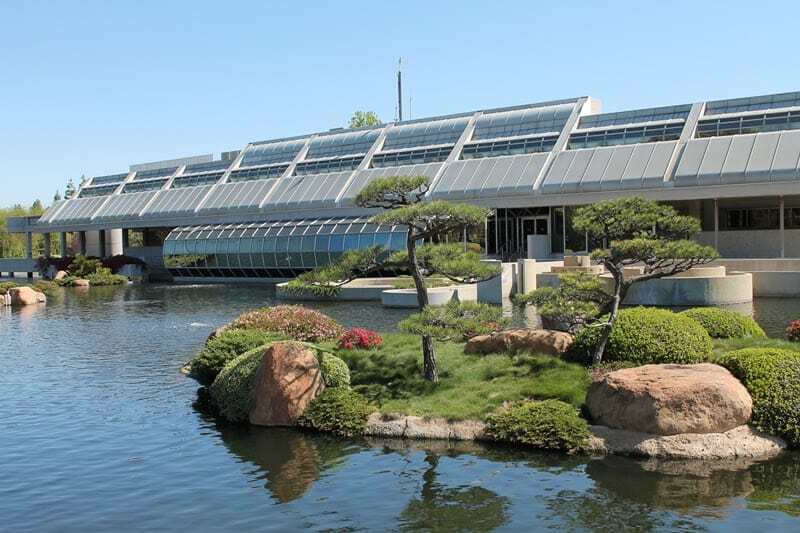 Visitors can climb the stairs to walk the promenade overlooking the gardens from the same place that Captain Kirk did or stroll in the opposite direction for an elevated view of the entire plant that ends in a circular viewing area where videos explain the water reclamation process. From this second story viewing platform, the entire garden can be viewed providing the best opportunities for photographers. If you go, The Garden is open Monday – Thursdays 11 a.m. – 4 p.m., and on Sunday 10 a.m. – 4 p.m., but no one is admitted after 3:15 p.m. The garden is closed on Fridays and Saturdays and on all city of Los Angeles Holidays or within 24 hours of rain. Admission prices- Adults – $5, Seniors 62+ – $3, Children under 12 – $3. Admission prices vary for special events. Groups of 15 or more: Please call ahead to make arrangements. Please call on the day you wish to come to make sure the Garden is open. From the 405 Freeway take Burbank Bl. Exit and go north to Woodley then follow the signs to the gardens free parking lot. 5 most beautiful flower garden in Europe.